My husband Blake and I are the ultimate DIYers. We bought, remodeled and rehabbed our 1920s-built home, re-roofed, tended to our 11 acres of Missouri land, both worked full-time, and then got engaged. So after we were engaged, being such DIYers it only seemed natural that we would not only pay for our wedding ourselves, but also hold the wedding at our home, in true DIY fashion. Fellow DIYers know well that while the projects that you take on are a labor of love, they are still labor. Blake and I worked for a year-and-a-half on the wedding plans together. From finding the right vendors, to landscaping the lawns, to making the centerpieces and favors, we worked together to make our wedding just what we wanted it to be and to stay on budget. While working so hard on the house, the wedding and at our jobs, we started to daydream and talk about the kind of honeymoon we wanted. 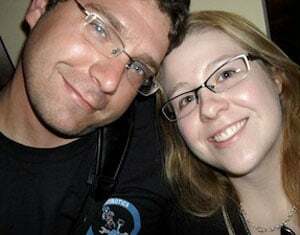 We started small, thinking about the budget, talking about a trip to Colorado or Florida, but we had both already been to both states and have done most of our traveling in the US. We wanted something new to us both, someplace warm and beautiful, where we could just relax and be taken care of for a change. So one night Blake and I got online and just looked for places to go and things to see. That night we found Jamaica. As we looked at photos of pristine beaches, lush green mountains and turquoise blue waters, our imaginations swam. We knew that Jamaica was the perfect spot for our first days as husband and wife. We made a down payment and booked the trip to Montego Bay that night. The only trick was how to pay for the rest of it. With the house payments and the remodeling and paying for our wedding at home with all the trimmings, the budget was tight, so we started saving here and there for our trip and started researching a way to help add to our honeymoon fund. A few weeks later I found Traveler's Joy. I researched many honeymoon registry sites, but it was Traveler’s Joy that offered the easiest access with the most tools. I also loved that my husband and I could build our site ourselves, adding pictures of the items on our registry, setting the pricing as well as adding our own slide shows. The Traveler's Joy site was a DIY bride’s dream! We registered for everything from help with our plane tickets to a swim with dolphins. As the months progressed, Blake and I continued to work on the wedding and had fun showing off the registry site to our friends and family. Then, finally, our wedding day arrived on May 22, 2010. All of our hard work paid off as we had our wedding at our home, our way. A ceremony by our pond, with our guests seated beneath the apple trees and a tented reception surrounded by twinkle lights and fireflies on a warm beautiful May night. Everything went well, including our wishes for the registry as we received gifts towards our dream honeymoon and no small kitchen appliances! So Sunday after the wedding we packed and early Monday, May 24th, we boarded a plane Jamaica-bound. After a long day of traveling, we were excited but a little tired when we touched down at Sangster International Airport, but we soon perked up when we found that the all- inclusive resorts have their own plush little waiting rooms at the airport. We found the waiting area for Sandals where they checked our names on the list, took our luggage and directed us to have our first Red Stripe of our Jamaican honeymoon! Blake and I were instantly relieved, relaxed and so at home before we even got to our resort. About fifteen minutes later we were on board the shuttle bus to our resort, the Sandals Carlyle. Everywhere we looked there were Jamaicans listening to music and celebrating and our driver told us that we had arrived on a Jamaican holiday, much like our Labor Day. Their happiness was contagious. We felt like part of the celebration. When we arrived at our resort, we were greeted warmly with fresh drinks and shown to our room. A chilled bottle of champagne and cheese and fruit platter awaited us and rose petals were sprinkled on the luxurious mahogany four poster bed. As we settled into our room, we could hear the music from the street below providing a perfect sound track to our first night in an island paradise. On Tuesday we got some much-needed rest and relaxation. We ate, drank, swam, and just took it easy, soaking up the sun and the beautiful sights all around us. On Wednesday, we joined a tour group and went to Negril where we went snorkeling and were stung by some very small jellyfish. It wasn’t as bad as expected, but it also was one of those experiences you’ll never forget. We also learned about Jamaican history and culture and even were introduced to some basic Patois phrases. Our final destination that day was the cliffs at Negril. Here we spoke to a Jamaican man charged with the responsibility of communicating the only one real rule about jumping off the cliffs into the ocean, which is close your legs. My husband watched two of the other guys jump and then I saw the gleam in his eyes. A minute later he was dropping 30 feet into the ocean and smiling the whole way down! A half-hour later we watched a breathtaking sunset from the cliffs that made the ocean glow with a golden trail of light that was truly spectacular. Thursday officially began the rainy season in Jamaica. We ventured over to a private island that was created in the 1880s by a hurricane and looked out at the tide pools. We also did a little hobie cat sailing until a storm picked up. That night it poured. Our dinner in the open air Japanese restaurant that night was like eating in a waterfall. Also, the rain brought out the crabs. The gray ghost crabs were everywhere, crossing the road or scuttling by you outside. On occasion one would make its way inside the hotel and the staff members would track it down to take it back outside which made for quite a show for the rest of us. Even a rainy night in Jamaica was entertaining! Friday was our last full day in Jamaica and we made it a good one. 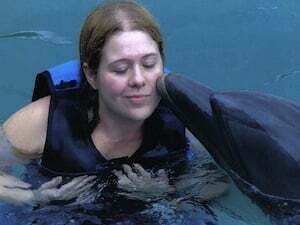 Since I was a kid, I always wanted to swim with dolphins. On Friday, Blake and I traveled to Ochos Rios. 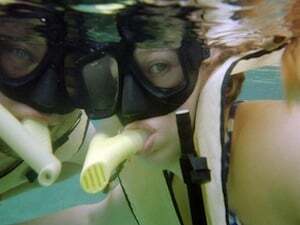 Once there, we received some training about how to interact with the dolphins, suited up and were shown to the lagoon. The dolphins immediately recognized our presence and playfully looked up at us from the water. We went down the stairs to the waters edge and swam out. There the dolphins began to approach letting us gently stroke their sides as they swam. Somehow they were much larger than I had ever realized and incredibly strong. 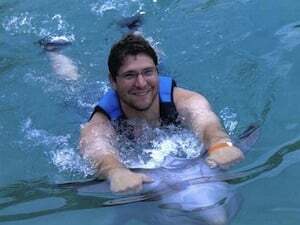 After learning more about the dolphins, it was time for a dolphin ride. I swam out and gave the sign to the dolphin and he let me grab onto his pectoral fins and we went sailing around the lagoon together so fast! It was an amazing feeling. The ride was followed up with a little dolphin kiss on the cheek. It was a wonderful once-in-a-lifetime experience that I can cross off my bucket list thanks to the Traveler’s Joy registry gifts that made it possible. Finally, Saturday morning we got up and prepared for our flight back home that afternoon. As we packed up our mementos from our trip, we talked about the entire week. We were so glad that we had let ourselves have this honeymoon and that Traveler’s Joy and the gifts from our friends and family had helped us have that experience. Our days in Jamaica were worth every penny of the $3,000 dollars spent, as the memories we created were truly priceless. There was no better place for the two of us DIYers to relax and spend the first days of our married life together. After we finished zipping up the last suitcase, we made the decision to go down to the lobby and booked our trip back for our anniversary. We can’t wait to do it all over again.